A new book by a highly experienced development economist is now out. The book challenges many assumptions about poverty in Africa – and calls for fresh thinking to understand and tackle the causes and the complex issues that combine to drive the mass migration of people from sub-Saharan Africa to Europe. THE FAMINE NEXT DOOR is a learned and passionate understanding of issues that ‘experts’ make more complex than they are. 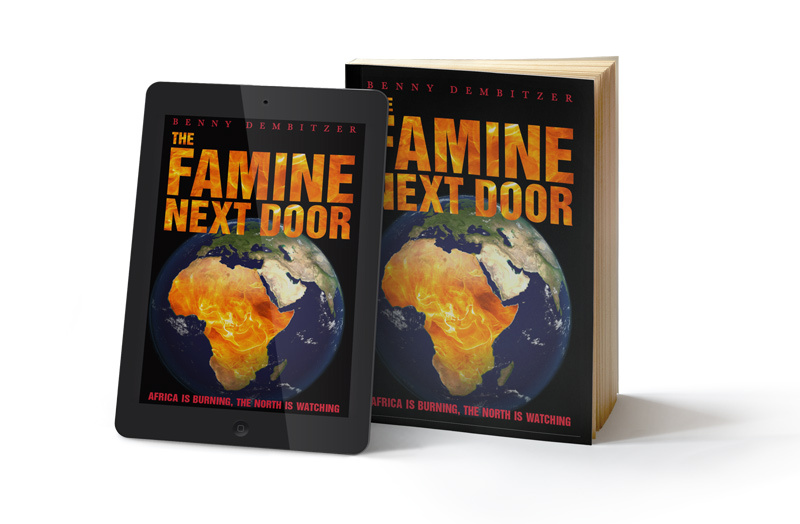 Benny Dembitzer in his book “THE FAMINE NEXT DOOR” graphically captures the state of our suffering and neglected world, the millions of populations, dying children, escaping young men and women from the Global South, mainly from Africa, victims of natural and avoidable man-made disasters. He writes as a passionate “knowing voice” of the poor, neglected and marginalised, caught in a medley of dysfunctional governments and competing multinational aid organisations. The author, Benny Dembitzer, argues that “The push factor forcing people to escape is greater than the pull of Europe. People cannot survive in their own countries. Population growth is exponential. Climate change has dried their lands. Cities have become huge slums. There is no food. There is no water. They have to escape to survive”. If we look at the issues solely from the fear of being “swamped by aliens”, the fear factor being used by the increasingly right-of-centre governments in Europe and the US, we are unable to face up to reality. We need to help prevent the mass migration at its roots. The alternative is ever greater migration to Europe and further fragmentation of our own societies. We need to address the increasing causes of poverty and despair in the Global South and increasing threat of catastrophic famines. issues is a matter for basic survival for us all. A radical new approach is required. The author argues that governments in the North need to strengthen the capacity of governments across sub-Saharan Africa to improve their ability to govern. That not only requires less centralisations of decision-making but tackling corruption at all levels and encouraging transparency. International non-governmental agencies, from Oxfam to Christian Aid and World Vision to the International Red Cross need to reach people at the grassroots. That can only happen if they support the poorest – smallholder farmers, women, refugees, slum dwellers, the handicapped, nomadic people – and tackle the issues that affect them. At present most of these agencies are creating a large number of people who are loyal to their own paymasters, but are undermining the long-term ability of those countries to co-op the ablest people into public service. Benny Dembitzer was a member of the team awarded the Nobel Peace Prize in 1985.Over the last 50 years he has specialised in the economics of developing countries, particularly in Africa. He is the author of two previous books; ‘The Attack on World Poverty: Going Back to Basics’ (2009) and ‘Sleepwalking into Global Famine’ (2012). He has taught at Cambridge, Cranfield, Southbank and Greenwich Universities; and has worked in more than 35 countries with a number of statutory and voluntary agencies. The Global Development Course offered an in-depth analysis of a wide range of issues concerning international development and the role of different actors. I thoroughly enjoyed the course and have come away with some new perspectives and insights which I am sure will be helpful within my role.